News in over the weekend from Cromwell Littlejohn at Merle Wood & Associates of a $1 million price drop on his central listing, the 37m Denison motor yacht News. She was designed by Joe Langlois and built by Denison in 1986. 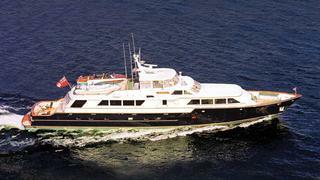 This large volume superyacht has walk-around decks and an enclosed aft deck. Accommodation is for six guests in three staterooms and twin 1530hp MTU engines give her a range of 1,000 nautical miles. She underwent a major refit in 2002. Lying in West Palm Beach, News is now asking $2,475,000.